The Callejon de Huaylas is an extensive interandine valley of 150Km approximately, it starts in Conococha at 4100m / 13 451ft in South and finishes in Cañón del Pato in North at 1800m / 5906 ft, this valley is located between the Cordillera Blanca and Cordillera Negra (White mountain range and Black mountain range, respectively), in Ancash departament (state). Along the valley runs the Santa River that has its source of the melting of the ice and snows of the Cordillera Blanca, and it provide of water to many towns that are located in the valley. Most of these towns are the access points to get to the lakes and mountains of the Cordillera Blanca and of the Huascaran National Park. 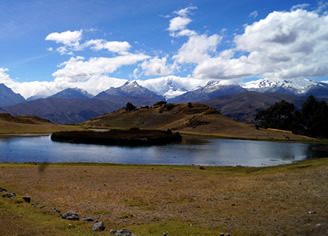 The most important city in this valley is Huaraz, place where we are located the most important tourist services like hotels, restaurants, banks, bars, travel agencies, Etc. Each one of these towns has enormous cultural wealth, with traditions, customs, etc. they vary among them and makes the Callejon de Huaylas an odd destination for the visitors.